“Justine is an amazing doula, and I would definitely select her again. She takes time to get to know her clients and tailors her doula services to fit the personalities and needs of the couple with whom she is working. I felt that her background of Bradley training as well as her own labor experiences prepared her to deal with almost any situation that could have arisen. “My wife and I were set on having natural childbirth, but we didn’t know exactly how that would happen. We were very late into the pregnancy before we discovered The Bradley Method®, so late in fact that we were unable to sign up for any group classes. Thank goodness for Justine! 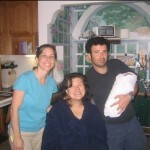 “My whole birthing experience with my Doula made me realize how important it is to have a doula. You have that extra support, love, understanding, caring and very helpful experience that you can possibly imagine while you are having your baby. That made it so much easier and also made it a wonderful experience that I will never forget.